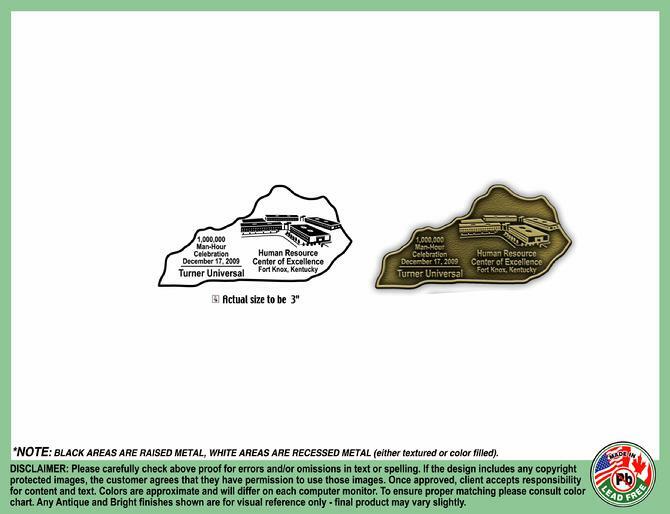 Beck's Mini Mall is an authorized distributor for AT Designs Custom Medal Manufacturers. Why use Beck's Mini Mall to order your custom made challenge coins? Have you ordered coins through the internet to save a few bucks and had poor quality product delivered and be stuck with what you have? Have you had issues with multiple artwork charges, hidden charges or other multiple emails to get what you wanted? Have you wished you could see samples before buying? Have you wanted to talk to a person and work the art on screen instead of sending PowerPoint slides back and forth? Have you ever wanted to just talk to the person you are ordering from in person? Have you ever had a problem where the vendor couldn't take the Government IMPAC card or GOV Contract? All these and more would give you the reason to at least come by and get a free quote on the coins. Most coins can be delivered in 4-6 weeks and one rush job for 25 coins was done in less than 10 days. I'll work with you and your artwork to get what we need to get to the factory for the quote. After the price is agreed upon, you commit to the purchase and we send off for artwork approval. We will get a graphic rendering of the coin and what the finished coin will look like (see sample below of a single sided coin, you will get a file emailed to you like this). Once you approve the artwork, your Command pays and the coins are ordered. Depending on factory backlog, design complexity, number of coins desired and type of coin finish to include colors, your order will be delivered here in Muldraugh in usually less than 4-6 weeks. AT Designs is located in New York state and has a factory located there, one in Canada and for some coins they out source to China. All coins are lead-free tested and come individually wrapped. My price will include shipping, art and die setups as required in the bottom line and written up in a GOV friendly per coin costs for your S4 approval. Sample Coin Rendering (I also have a sample of this coin in the store for comparison to screen image). You will get a copy of a similar image of your coin after design before buying.